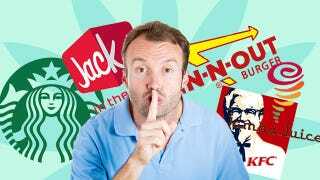 You may already be familiar with In-N-Out's fabled secret menu, but it's just one of several popular food chains whose order options aren't limited to what's on display. In fact, there's a menagerie of exotic items and flavor combinations just waiting to be uncovered, if you know what to ask for. Here are five of America's most popular hidden menus. Some ground rules before we dive in: First and foremost, don't be a jerk. Understand that while most franchises are willing to accommodate virtually any request a customer has—"the customer's always right" and all that—some shops may simply not have the necessary equipment, inventory, or know-how to make your off-the-menu item. Second, fast food chain workers in general get paid the state minimum wage—even less if they get tipped—and aren't actually required to know what grey menu item you're talking about, so don't be offended if the guy behind the register doesn't jump out of his shoes to make your double-soy, half-caff, triple-caramel, choco-macchiatio monstrosity just the way you like it. Last, a huge shoutout to Starbucks Secret Menu, Secret Menu-holic, and Hack the Menu, all of which were invaluable resources that go into even more depth than we're able to here. Ready? Let's get to ordering. Double Meat, Double Cheese, or any multiple thereof: More commonly known as a Double-Double, this will score you an extra patty and an extra slice of cheese. If you want three patties and three slices of cheese, ask for a triple-triple. Any more than that, or if you want buns interspersed between the patties (like the half bun McDonald's uses to layer Big Macs), ask for a "3 by 3", "4 by 4", etc. Grilled Cheese: If you'd rather skip the patty altogether, you can also easily order a grilled cheese sandwich instead. As the company website describes, this item includes "two slices of melted American cheese, hand-leafed lettuce, tomato, spread with or without onions on a freshly baked bun." But no meat. Animal Style: Slather your burger with a special sauce replete with chopped pickles and grilled onion bits. You haven't eaten an In & Out burger until you've eaten it animal style. Customized Fries: Like their burgers, In & Out's fries are made to order. Ask for them Well Done (super crispy and greasy), Light Well (aka medium-well), with or without salt, or with a layer of melted cheese—you can even get them animal style if you're feeling adventurous. Protein Style: Looking to maintain your figure? Then you probably shouldn't be eating fast food. But if you just gotta have a burger, minimize its impact on your waistline by foregoing the bun and swaddling your patty in a lettuce wrapper instead. Root Beer Float: Mixing equal parts vanilla shake and root beer soda, this creamy concoction doesn't need a spoon. Red Velvet Frappuccino: This chilled concoction consists of a Half White Chocolate/Half regular Mocha Frappuccino blended with raspberry syrup and topped with whipped cream. Strawberry Shortcake Frappuccino: Have the barista fill strawberry juice to the first line of the cup and milk to the next. Then have him blend two scoops of vanilla bean powder, three pumps of white mocha syrup, one pump of toffee nut syrup, a dash of creme base, ice, and whipped cream together before pouring it into the cup and topping with whipped cream. Tip well; this is a pain to make. Cotton Candy Frappuccino: This delectable treat is surprisingly simple to make. Just ask the barista to add a pump or two of raspberry syrup to your vanilla bean frappuccino. The Short: Want just a little bit of coffee? Like, less than a tall? You're in luck. Starbucks offers an even smaller serving—essentially a kid's cup—known as the "Short." Ordering special drinks from Jamba Juice can be a bit tricky—not because the shop doesn't have the necessary ingredients, but because there's no guarantee that the clerk will know what you're talking about. It's not like one can inherently divine the ingredients of these drinks by name alone, though they do taste just like they sound, so be sure you have a solid understanding of what goes into these drinks before you order. Here are four of the most popular off-menu items offered by the fruit juice chain—there are more than 40 custom concoctions in all—as explained by Secret Menu-holic. Heck, there's very little stopping you from making these yourself, at home, for a fraction of the price. All you need is a decent blender. White Gummi Bear: One of three gummi bear variations (the other two being blue and red), a white gummi bear combines soy milk, peach juice, mango chunks, and four types of sherbet. Mix 6 ounces of peach juice and 4 ounces of soy milk. Add 1 scoop each of Lime, Raspberry, Orange, and Pineapple sherbet (you can easily replicate this with generic a tub of tutti-frutti sherbet from your local bodega's freezer section), as well as one scoop each of crushed ice and Mango chunks. Skittles: With a base of peach lemonade and lime sherbet combined with frozen yogurt and strawberries, a Skittle's smoothie is both sweet and tart, just like it's namesake. Mix 1 cup of Peach Lemonade and one scoop lime sherbet. Pink Starburst: A bit creamier than the Skittles, a Pink Starburst leverages all the sherbets as well as lemonade and soy milk to make arguably the best tasting item not on the Jamba Juice menu. Sourpatch Kids: Lip-puckeringly tart, the Sour Patch Kids smoothie may not be for everyone. Ask for a scoop of frozen yogurt or a dash of soy milk if you find the mix too sharp for your liking. Pour 12 ounces Lemonade into a blender jug. Add one scoop each: Pineapple, Raspberry, Lime, and Orange sherbet, as well as one scoop of blueberries. Whether you're in it only for the delicious, crispy skin or the whole wing, these four off-menu additions found on Hack the Menu will make your fried chicken finger lickin' good. And there are plenty more where that came from. Drown It in Mashed Potatoes: Easily the best item on the KFC menu, mashed potatoes make everything better. Add them to your meal, add them to your sides, add them to your sandwich—hell add them to your drink. There's nothing that KFC's mashed potatoes and gravy don't improve. All you have to do is ask. Double Down: Who needs bread when you've got a breaded chicken breast, nay, two breaded chicken breasts? The KFC Double Down, essentially a chicken sandwich that replaced the buns with breaded breast meat—and replaced the lettuce, tomato, and onion with bacon and melted cheese—may not have lasted long as an official menu item, but it is still very much available to those who know to ask. For an extra dash of self-loathing, you can make it a triple. Baconize It: You're clearly not eating at KFC for its health benefits, so you might as well up your caloric ante with an extra smattering of bacon, right? Considered mashed potato's meat equivalent, you'll be hard pressed to find a menu option that can't also include bacon. Poutine that Poultry: Poutine, Canada's national snacktime treasure, combines the deliciousness of french fries with the curdledness of, um, milk curds (you know, the solidified precipitate of the cheese-making process), and tops the whole ordeal with gravy. If you want it, all you have to do is ask, but won't somebody please think of your arteries? His real face isn't the only thing Jack is hiding. The fast food outlet has a number of exotic off-the-menu combinations, also found on Hack the Menu. Extra Cheese and Patties: Like In-N-Out, Jack in the Box is happy to add as many slices and patties the that burger as you wish. Just ask, but don't let your eyes outpace your stomach. Bacon Bacon Cheeseburger: The single best item on the JitB menu isn't actually on the menu. The Bacon Bacon Cheeseburger (or BBC) augments the simple deliciousness of a basic cheeseburger with the savory goodness of two strips of bacon. You can also swap in sourdough bread if you so choose, though either way avoids the cholestoric overload inherent with the chain's Bacon Ultimate Cheeseburger. Loaded Grilled Breakfast Sandwich: It's early, you're hungry, now is not the time for halfhearted breakfasts. Don't mess around in the morning when you can order a Loaded Grilled Breakfast Sandwich—a conventional Grilled Breakfast Sandwich but with an additional pair of fried eggs, two slices of ham, two slices of cheese, and two strips of bacon. Of course, there's nothing stopping you from adding any other meat/cheese/deep fried product from the menu if you so choose. Mint Oreo Shake: A flavor mix exceeded in popularity only by peanut butter and chocolate, it's surprising that Jack in the Box's Mint Oreo Shake isn't on the regular menu, given how much people request it. Yes, it tastes exactly how it sounds—delicious. These are just a few of the numerous hidden options that restaurant chains across the country offer. Remember that it's always best to ask nicely, and that not all locations will offer every option. If you've got a favorite fast food concoction, tell us all about it in the discussion below.